What is the correct color of the block for a 1929 Century 8 cylinder engine? Was the crankcase painted also or was it left natural Aluminum color? What about accessories and water tubes, spark plug cover and the like? Same color? 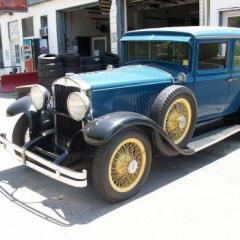 There was a article on a 1928 Hupp with a 8 cylinder and it was painted black, it that what a 29 would be? 8 cyl were painted shiny black. Most 6 cyl were a green close to Packard Green. A few 6 cyl were black. For all '28 and '29 M series cars the crankcase was natural aluminum, the oilman natural zinc and the block, head and all accessories were gloss black. The carburetor, whether the pot metal UU2 or the bronze UU2, were painted in aluminum paint. I have one nearly all original '29 and two '28s, one of which was un touchd before a cosmetic overhaul, and they, as well as several parts cars, had these details. That has led me to assume they are correct.